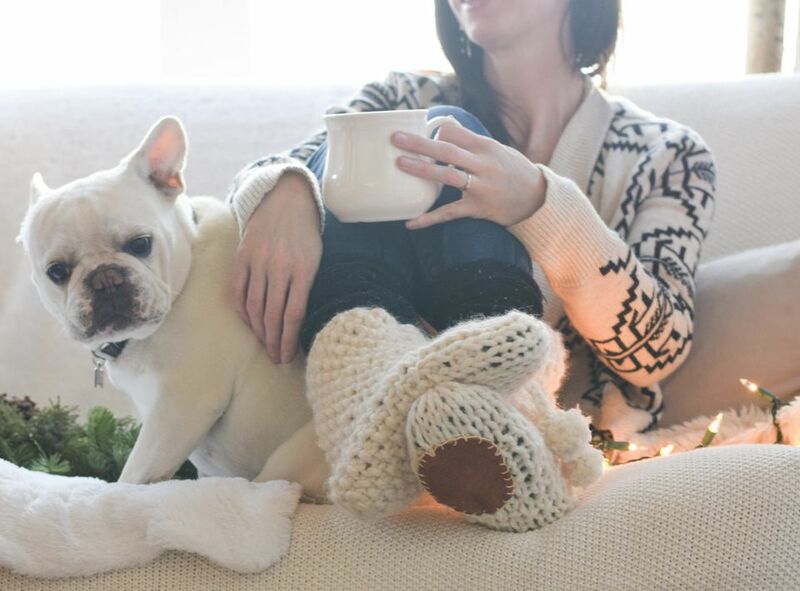 Keep your feet cozy and warm when you work up one of these slipper knitting patterns! No matter the season, sliding on a pair of soft slippers keeps your feet comfortable around the house. Handknit slippers also make a great gift and you can knit many of the patterns in this list in an evening or two. And while some of these slippers are more like knitting a sock, others start flat and then you sew them together. Choose the technique and style that suits you best! Want slippers that are squishy, soft, and cute to boot? Cast on these Modern Mocs from BEKAHknits. The PDF includes multiple sizes for both women and men. This pattern would be best for an intermediate or advanced knitter, as it uses a few more advanced techniques. But even if you're new to knitting, this would be a great pattern to aspire to! You can knit these slippers with garter stitch and a few knitting basics. Follow the free pattern to knit a flat piece with some decreasing, then sew up the heel. To close up the top, use crochet for a functional detail that adds a bit of fun contrast. And while this only includes one size, it's easy to adjust the length to fit. With ankle-sock styling, these simple slippers are the ones you'll want to pull on any time of year. Sam Lamb shares this pattern on her blog, but don't miss the link to download it as a PDF too. Worked mostly on double-pointed needles, this is a good pattern for folks who are comfortable with sock knitting. Bunny slippers may be traditional, but these slippers are foxy. And they even have a tail! Knit this free pattern flat, then stitch it together and add the separate ears and tail. These will take some time, but the tutorial includes a few photos of the tricky bits. Designer Anita of Gurimall Design recommends making these cabled slippers as house shoes for guests. You can knit a pair in a few evenings and then keep them near your door for visitors. Be sure to check the other patterns from this Ravelry shop to find other socks and more. These ballet-style slippers, designed by Nazanin S. Fard for Red Heart Yarns, have knit flowers that adorn the toes. But even if you don't add the flowers, this is a great slipper pattern with a few delicate details. You might think these bunny slippers are for kids, but they're actually adult size! The heart-shaped flecks of color come from wool roving "thrums," which you add in as you knit. They create a fun design on the outside and a fluffy inside that felts with time, giving the slippers extra strength. Plus, they're cute! If you enjoy Fair Isle knitting, you'll love these Arctic Starflower slippers. The design of the colorwork has a traditional Nordic feeling, but so does the overall style. Knit them in the round, working from heel to toe, for a very special pair of slippers. When woolen knitted items felt in the laundry, that's usually a bad thing. But this pattern starts out bigger so you can felt the slippers, resulting in a stronger and more sturdy item. If you only need one size of these slippers, look for the original Duffers pattern, which costs a little less. Otherwise, go for this full version with six sizes and three width options. 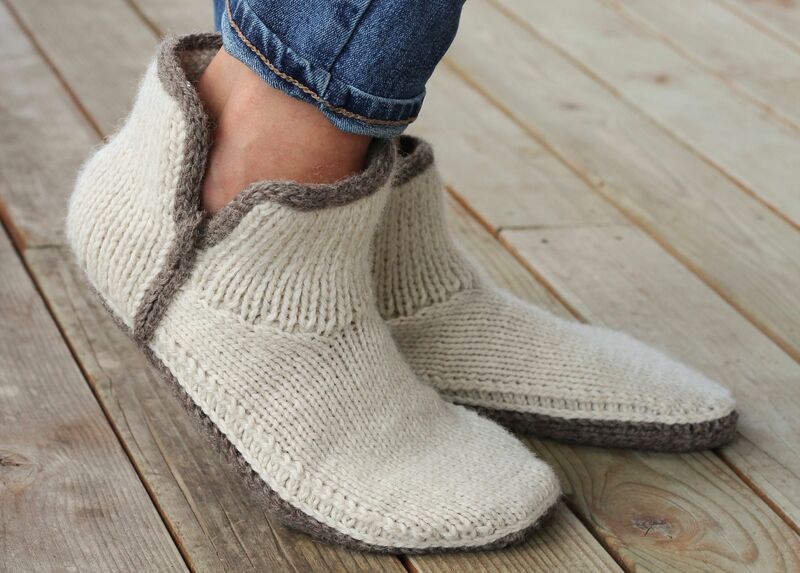 Grab some chunky yarn and knit these boot slippers in a flash! You won't need to use double-pointed needles, which makes them a little easier for beginners. Plus, you can add non-slip pads to the bottoms for a fun and functional detail. Brioche knitting creates a thick and warm material, often in two colors. Use that technique to knit these slippers in a colorful combination of yarns. The shape of the slipper itself is simple, so you can focus on keeping your stitch tension looking great. Slip into comfort with some sock-like slippers with a slouchy cuff. You can knit them on double-pointed needles or use the magic loop method. Plus, with extra bulky yarn, you'll have no trouble knitting through these in a hurry. Biscotte Yarns shares this free pattern for slippers in just about any size you can imagine. Ranging from six to 12 months all the way up to a men's extra-large, this is a generous pattern that's exactly what you need to make cozy footwear for the whole family.